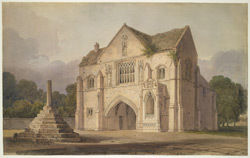 This watercolour is of the broad and stately gatehouse to Radford Priory in Nottinghamshire. Although the majority of this building was constructed in the early 14th Century, the ornate porch, seen to the right of the facade, was added later. The porch is noted for its relief panel, which depicts the Adoration of the Magi.